You’re Looking at Me Like I Live Here and I Don’t (documentary) Perhaps years from now, after a scientific breakthrough has turned Alzheimer’s disease into a memory as distant as polio wards are to younger Americans today, someone will stumble upon Scott Kirschenbaum’s hard-to-watch documentary, “You’re Looking at Me Like I Live Here and I Don’t,” and be stunned. “I’ve read about Alzheimer’s,” this person will say, “but I had no idea what it was actually like.” – The New York Times Click here to watch clips from the documentary. I Feel Bad About My Neck and Other Thoughts about Being a Woman by Nora Ephron With her disarming, intimate, completely accessible voice, and dry sense of humor, Nora Ephron shares with us her ups and downs in I Feel Bad About My Neck, a candid, hilarious look at women who are getting older and dealing with the tribulations of maintenance, menopause, empty nests, and life itself. Ephron chronicles her life as an obsessed cook, passionate city dweller, and hapless parent. But mostly she speaks frankly and uproariously about life as a woman of a certain age. Utterly courageous, uproariously funny, and unexpectedly moving in its truth telling, I Feel Bad About My Neck is a scrumptious, irresistible treat of a book, full of truths, laugh out loud moments that will appeal to readers of all ages. The End of Old Age: Living a Longer, More Purposeful Life by Dr. Marc E. Agronin Dr. Agronin is a geriatric psychiatrist at the Miami Jewish Home whose decades of caring for the aged have taught him that it is possible to maintain purpose and meaning in life even in the face of significant disease and disability, impaired mental and physical functioning and limited participation in activities. Happiness Is a Choice You Make- Lessons from a Year Among the Oldest Old by John Leland An extraordinary look at what it means to grow old and a heartening guide to well-being, Happiness Is a Choice You Make weaves together the stories and wisdom of six New Yorkers who number among the “oldest old”― those eighty-five and up. The Big Shift: Navigating the New Stage Beyond Midlife by Marc Freedman Marc Freedman, hailed by the New York Times as “the voice of aging baby boomers [seeking] meaningful and sustaining work later in life,” offers a recipe for how we can transform America’s coming midlife crisis into a midlife opportunity. Millions of people in their fifties, sixties, and seventies are searching for answers to the question “What’s next?” and are navigating their way to an entirely new stage of life and work, one that could last as long as midlife. Shifting to a much longer lifespan isn’t as easy as it may seem. Unlike the transition from adolescence to adulthood, managing this process for many is a do-it-yourself project. Drawing on powerful personal stories, The Big Shift provides not only direction but a vision of what it would take to help millions find their footing in a new map of life. 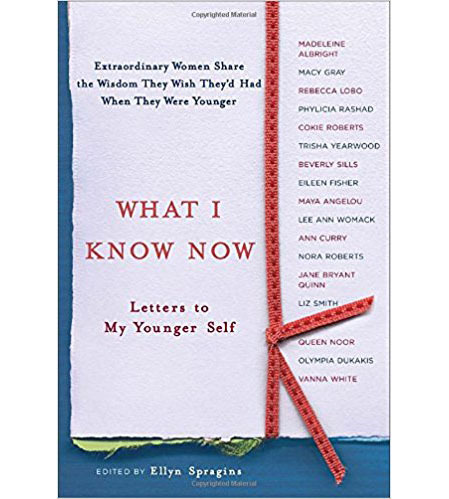 What I Know Now: Letters to My Younger Self edited by Ellyn Spragins If you could send a letter back through time to your younger self, what would the letter say? In this moving collection, forty-one famous women write letters to the women they once were, filled with advice and insights they wish they had had when they were younger.